GX602 est évalué 4.5 de 5 de 15.
your website says it will fit my 2013 kia forte 5 door. crutchfield says no. will it fit? You need to mod. The best way is to do it, is to mod the factory speakers and re use the mount portion of the speaker. The GX602 has a RMS power of 60W at 2.3-ohms. 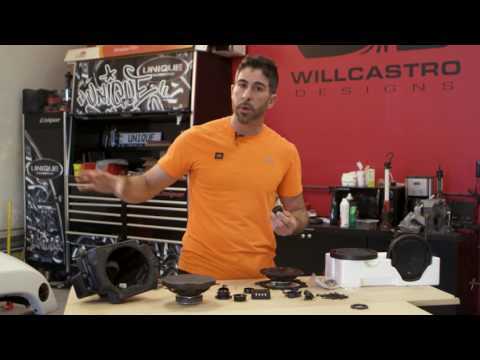 Will this speaker fit my 2014 Jeep Wrangler Sport Unlimited rollbar? &nbsp;Also do I need any type of wire adapters? If your vehicle has 6 1/2&quot; speaker mount, then the GX602 would fit your vehicle. The GX602 is a 6 1/2&quot; coaxial type of car speakers, so you would need to use a coaxial cable for it. My car stereo has 4ohm output. I am confused because the marketing states true 4Ohms technology and the tech specs are rated at 2.3 nominal? Will these work with a 4ohm stereo system? Please clarify and inform. With our speaker's True 4 ohm technology, as the speaker starts playing, the coils will warm up, and the net impedance will increase. This, combined with using the long typically thin gauge stock speaker wire in the car, will bring the overall nominal impedance up to nearly 4 ohms, and will work safely with all head units/amps. Will these fit in my 2016 Nissan rogue. I'm planning on replacing both front and rear door speakers. Any suggestions would be helpful. Unfortunately, the GX602 won't fit in your car. GX602 will fit in my toyota yaris 2008 HB 5 doors?? If the speaker mounts in your vehicle can accommodate a 6 1/2&quot; size of speaker, then the GX602 will fit your vehicle.